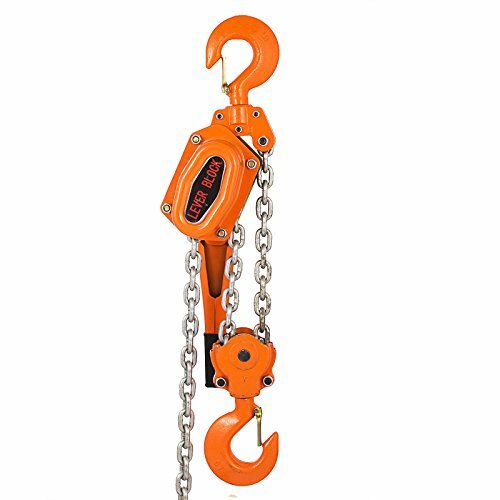 Mini - hoists are the most compact ratchet lever hoists in the market, perform just like the larger models except they're small enough to fit in the palm of your hand. Plated load chain is standard. Weston-type load brake. Rubber hand grip for better comfort and security. Lightweight design for ease of portability. Use in confined conditions with one-hand operation. Forged upper and lower hooks with latches standard. Impact resistant, all-steel frame, gear case and cover. Hardened link-type alloy steel load chain for strength and long wear. Free wheeling feature serves to quickly attach the load. Metric rated. Capacity: 1100 lbs. 10' Lift. Chain Type. 11-1/8" headroom. 1-Year Warranty. 6-3/8" Lever length. 1 Reeving. 78 lbs Average handle effort. 1 Chainfalls. 11-1/8" Minimum distance between hooks. 1-9/16" Lift with one full lever turn. HSH-616 Lever Block Hoist with German Technology features Overload protection and meets all international standards such as GS,CE,EN,ANSI,AS/NZS1418.2. All steel construction for external impact resistance. High-stringth, cold-forged, alloy steel contruction for lighter weight impact resistance with long life. 360 degree rotating handle with short stroke to ratchet loads. Durable powder coated finish to prevent corrosion. Reliable non-asbestos disk braking system to prevent accidents. Single-hand free chaining is simple and convenient, allowing smooth, trouble-free operation in the vertical or horizontal position Hardened steel rollers supporting the load run smoother and last longer than bearings. 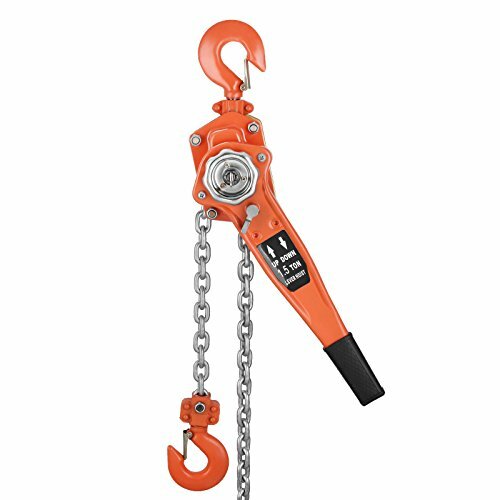 Mini - hoists are the most compact ratchet lever hoists in the market, perform just like the larger models except they're small enough to fit in the palm of your hand. Plated load chain is standard. Weston-type load brake. Rubber hand grip for better comfort and security. Lightweight design for ease of portability. Use in confined conditions with one-hand operation. Forged upper and lower hooks with latches standard. Impact resistant, all-steel frame, gear case and cover. Hardened link-type alloy steel load chain for strength and long wear. Free wheeling feature serves to quickly attach the load. Metric rated. Capacity: 550 lbs. 5' Lift. Chain type. 9-1/2" headroom. 1- Year warranty. 6-19/64" Lever length. 1 Reeving. 56 lbs Average handle effort. 1 Chainfalls. 9-57/128" Minimum distance between hooks. 3-19/128" Lift with one full lever turn. 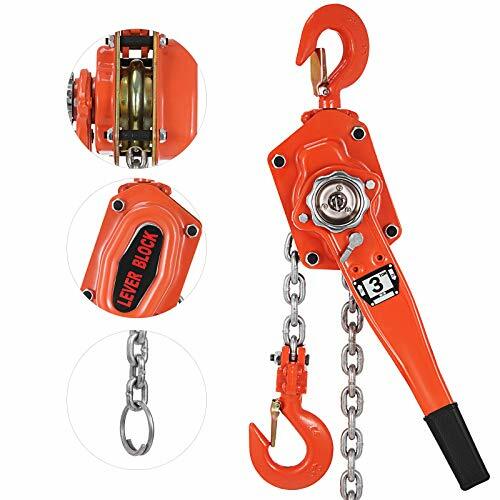 Mini - hoists are the most compact ratchet lever hoists in the market, perform just like the larger models except they're small enough to fit in the palm of your hand. Plated load chain is standard. Weston-type load brake. Rubber hand grip for better comfort and security. Lightweight design for ease of portability. Use in confined conditions with one-hand operation. Forged upper and lower hooks with latches standard. Impact resistant, all-steel frame, gear case and cover. Hardened link-type alloy steel load chain for strength and long wear. Free wheeling feature serves to quickly attach the load. Metric rated. Capacity: 550 lbs. 10' Lift. Chain type. 9-1/2" headroom. 1- Year warranty. 6-19/64" Lever length. 1 Reeving. 56 lbs Average handle effort. 1 Chainfalls. 9-57/128" Minimum distance between hooks. 3-19/128" Lift with one full lever turn. 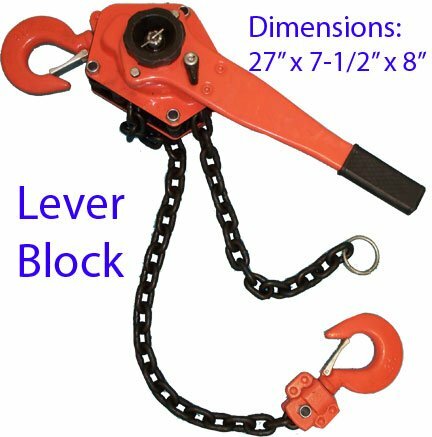 The All Material Handling ML005-10 mini lever chain hoist small size allows operation and storage in tight places. Planetary gearing is used to minimize operator effort and to reduce stress on the brake components. Self adjusting pawl and disc type mechanical load brake insures positive load control. HSH-616 Lever Block Hoist with German design. Meets all international standards such as GS,CE,EN,ANSI,AS/NZS1418.2. All steel construction for external impact resistance. High-strength, cold-forged, alloy steel construction for lighter weight impact resistance with long life. 360 degree rotating handle with short stroke to ratchet loads. Durable powder coated finish to prevent corrosion. Reliable non-asbestos disk braking system to prevent accidents. Single-hand free chaining is simple and convenient, allowing smooth, trouble-free operation in the vertical or horizontal position Hardened steel rollers supporting the load run smoother and last longer than bearings. Enclosed screw-and-disc type load brake stays clean and dry for positive load positioning. Through-hardened load chain provides high strength and resists wear. Number of falls 1. Maximum 46 lbf pull force. Minimum 11-5/8" head room. 9-1/4" Handle length. Comes in standard pack. 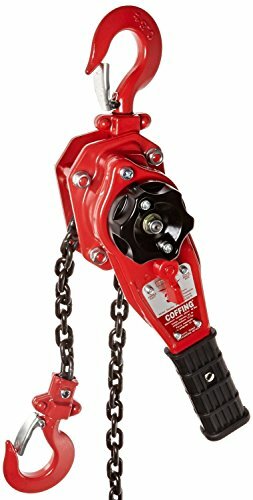 Mini - hoists are the most compact ratchet lever hoists in the market, perform just like the larger models except they're small enough to fit in the palm of your hand. Plated load chain is standard. Weston-type load brake. Rubber hand grip for better comfort and security. Lightweight design for ease of portability. Use in confined conditions with one-hand operation. Forged upper and lower hooks with latches standard. Impact resistant, all-steel frame, gear case and cover. Hardened link-type alloy steel load chain for strength and long wear. Free wheeling feature serves to quickly attach the load. Metric rated. Capacity: 1100 lbs. 5' Lift. Chain Type. 11-1/8" headroom. 1-Year Warranty. 6-3/8" Lever length. 1 Reeving. 78 lbs Average handle effort. 1 Chainfalls. 11-1/8" Minimum distance between hooks. 1-9/16" Lift with one full lever turn. Enclosed screw-and-disc type load brake stays clean and dry for positive load positioning. Through-hardened load chain provides high strength and resists wear. Number of falls 1. Maximum 55 lbf pull force. Minimum 14-31/32" head room. 13-3/4" Handle length. Comes in standard pack. 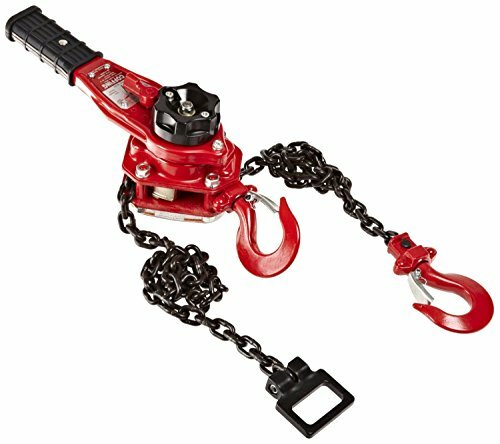 The CM Bandit is one of the most compact and durable ratchet lever hoists in the industry. Its lightweight and portable design, easy free-chaining feature and 360 degree rotating handle make it one of the most versatile hoists on the market today. 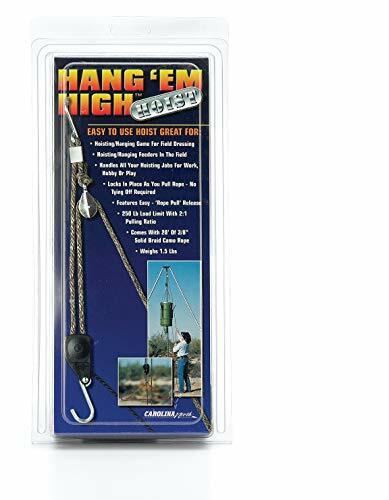 Hang 'me High Hoist is ideal for hoisting heavy and hard to lift items over head and then securing the items without tying knots. Great for: hoisting/hanging game for field dressing. Hanging feeder in the field. Handles all your hosting jobs for work, hobby and play. Locks in place as you pull rope - No tying off required. Features easy "Rope Pull" release. Easy to Use. Hang the Hoist by S-Hook located at top of hoist. Let system hang freely with ratchet at bottom and pulley in the middle. 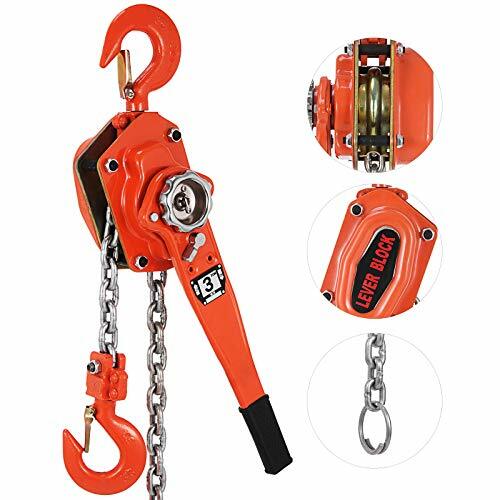 Attach object to be hoisted onto the hook on the rope ratchet. Pull the free end of 3/8" rope to raise the item. 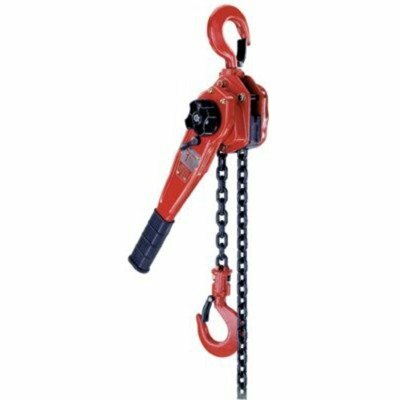 Hoist automatically locks into position as you pull the rope so there is no need to tie-off the end. 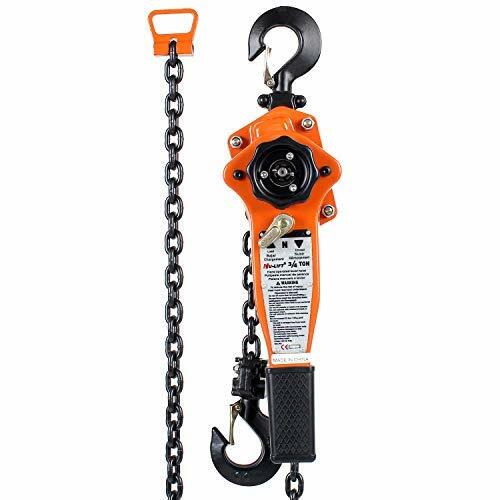 The All Material Handling LC008-10 lever chain hoist has easy one hand operation and set up. It allows for operation in any orientation. Light weight and durable formed steel enclosure.